Fridges are appliances which we expect to see in every home – but how do they get disposed of? Yes Waste Fridge Disposal can come and collect and dispose of your fridge so you aren’t’ cluttering your home or neighbourhood, or damaging the environment. Most homes have a fridge, freezer or both, and with an average lifespan of over 10 years, replacing them is not something we do very often. When they do go wrong, you may wonder what to do with your old one. Yes Waste Fridge Disposal and Recycling can help! Some shops offer to collect your old fridge but for many people this isn’t an option. For example, if you buy the fridge second-hand, from friends and family or simply didn’t choose this option from the retailer. For business purchases, you may find that removing items is an extra cost not included within the price. Disposing of old fridges and freezers may be more complicated than you think. Older fridges and similar normally contain a substances which can damage the atmosphere’s ozone layer, both within the cooling circuit and the “blowing agent” contained within the unit’s insulation. Due to the effects of these chemicals lasting over a century, the Government classifies fridges, freezers, chillers and air conditioning units as “Hazardous Waste“. The best and simplest way to remove an old appliance like this is therefore to donate it to charities, or family and friends, while it still works. If you attempt to transport a damaged or non-working fridge, you may be transferring hazardous waste which is prohibited. If you are householder you have less responsibilities than a business in dealing with Hazardous waste, provided you use facilities from your Council properly. However if you have contractors doing building work or renovation, you may need to agree with them how any additional waste is dealt with. When you arrange for a fridge to be collected by Yes Waste Fridge Disposal, you can be confident that it will be treated in an environmentally-responsible way. Here’s how it works. First the cooling gases are drained and removed. 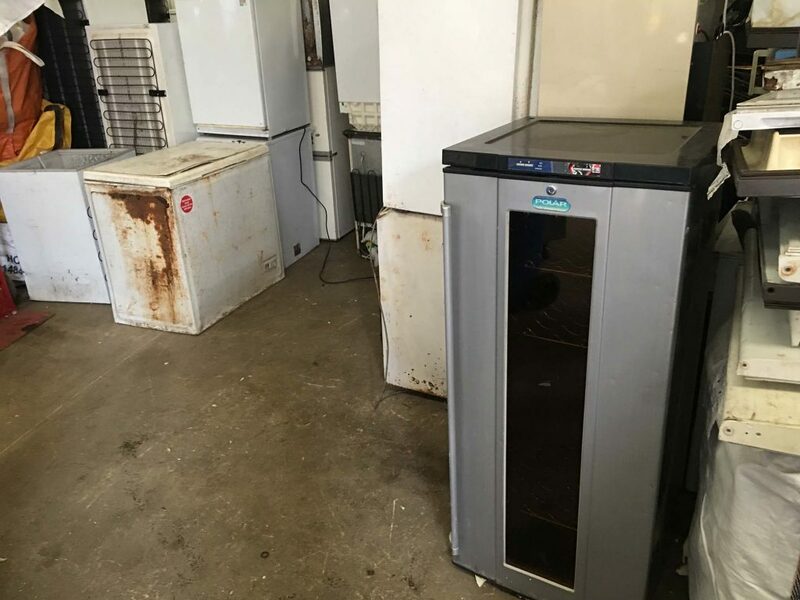 We can come and collect fridges, freezers and air conditioning units from homes and businesses across Yorkshire, and take them to our registered contractor who will follow the steps above. Contact us to get a quote, and we can arrange a time for a our team to attend. When we arrive you will get all the appropriate paperwork, including a Hazardous Waste Consignment Note and Waste Transfer Note. Our teams operate across Yorkshire. We are based in Wakefield, and regularly cover Leeds and West Yorkshire, as well as Sheffield, Barnsley and South Yorkshire. To get a quote on a collection from anywhere else, please get in touch.